A new, secular explanation of the Buddha's teachings on mindfulness.The Satipatthana Sutta - the 2,500-year-old teachings of the Buddha himself - is the original 'DIY manual' on howto meditate and be mindful. 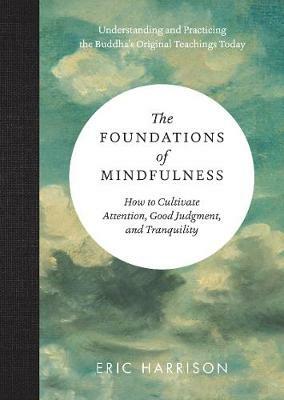 Just a few pages long, with 13 recommended practices, it provides the authority for theworldwide practice of mindfulness. However, this influential text has been neglected of late - not least because thecommon translation, in Victorian English, is virtually indecipherable. So, modern mindfulness students - focusedinstead on the Zen practice of 'just sitting' - risk missing the benefits of the Buddha's more sophisticated approach.In 1975, Eric Harrison retranslated the Satipatthana Sutta and made it the basis of his teaching career. Now, withhis new translation and commentary - informed by a lifelong consideration of the Buddha's original teachings - hemakes mindfulness more accessible than ever, particularly to those not coming to it by way of Buddhism or prior meditation practice. "A deeply engaging book which both Buddhist meditators and secular mindfulness practitioners around the globe will find useful. To help clarify mindfulness, Eric Harrison explores the relationships, overlaps, and divergences between western Buddhist meditation and secular mindfulness. Whatever your particular views and preferences on the subject, TheFoundations of Mindfulness will help you locate them. I also enjoyed Eric's translation of the Satipatthana Sutta for its accessibility." "The Satipatthana Sutta is one of the Buddha's foundational teachings on mindfulness. This commentary by a staunchly non-Buddhist mindfulness teacher makes for a stimulating and, at times, provocative read."